70 registered members (AML), 455 guests, and 229 spiders. Would original bars have a part number on them ? Are you referring to the 68-4980 bars? I do not remember seeing it stamped but it probably would be on the end under the grip or on the bottom side between the clamp serrations. No stamped numbers on originals that I have ever seen. I Have a 67 west coast hornet and it has the numbers stamped on it.....42 4968. They are stamped on the top left hand side. Right where the grip would go. Like Gary I had never seen them numbered before. When I was taking it apart to get them rechromed they looked a little different than what is on my other hornets not drastically different but different in the height and length. I almost thought they were the wrong ones until I seen the numbers stamped on them. I don't know how to post a pic since photobucket isn't an option. when I do I'll put in on here for you. 42 4968 WAS USED ON ALL U.S. A65 MODELS AND THE WASP IN 1967. I APOLOGIZE FOR THE USE OF CAPS. I CAN ONLY TYPE WITH MY RIGHT HAND SO USING THE SHIFT KEY IS BEYOND MY CAPABILITES. Compared to what we see on bikes today, the bars look "high," and "strange." 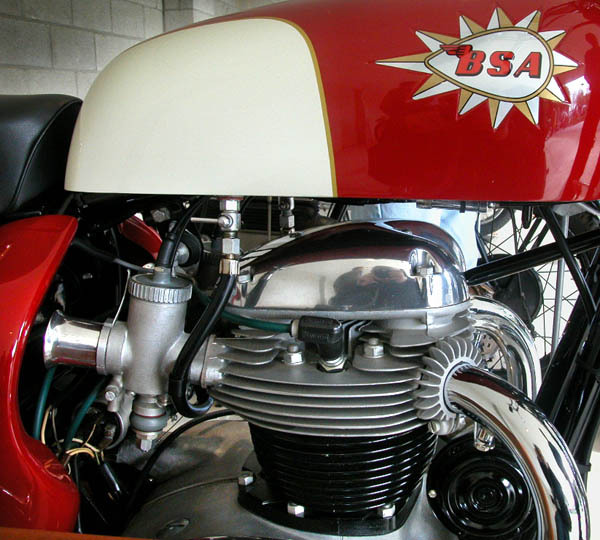 But then, it's small, stock BSA tank looks "strange" as well. Have original western bars from US '55 Golden Flash. No stamped numbers on it that I can see. Thing to note is the chrome/nickle under the handgrips didn't get polished. Might be nice to know if at a swap/jumble meet.